This small guide to healthy soils is a collaboration of 14 soil scientists and professors, gardening consultants and authors, garden curators, arborists, horticulturists, and engineers from across North America. Their interests and expertise have all converged into the idea that the goal for gardeners should be, as the title suggests, Healthy Soils for Sustainable Gardens. Nine chapters follow a fascinating introduction, to give us all the information we will ever need to provide the best environment for our plants in which to anchor their roots. Our knowledge of healthy soils has grown from the physical and chemical properties (texture, structure, pH, mineral content, etc.) to include the ecology of the soil. In other words, the ecosystem that provides a habitat from microscopic fungi and bacteria, to earthworms and millipedes. We now know that the key to long-term fertility and viability of our soil is dependent on this soil ecology. This hands-on guide explains the unique characteristics we want in our garden soil and how we can build our soil’s fertility with organic and sustainable methods. As we become increasingly aware of the depletion of the Earth’s resources, we should do our part in conserving these resources. The idea that we can create fertile and sustainable soil for our gardens and farms has great appeal to more and more of us. 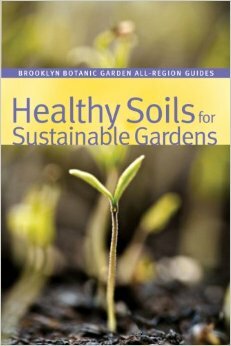 This handbook provides the basics of sustainable soil care. Chapters focus on the physical, biological, and chemical properties of soil and how they determine soil health. There is a wonderful chapter on getting to know the soil of our own gardens, and how to determine the unique characteristics that our own soil has. My favorite chapter is the Soil Care Strategies and its guide to resource-wise gardening. The author of this chapter explains that our goal should be to mimic nature through creating a closed-loop system, by recycling and using organic waste from reliable sources (preferably local) to recruit the organisms of the soil food web to build our soils along with the appropriate mulch. There is a section on Gardening in Challenging Conditions for those who have problem soils such as compaction, sand or clay, contamination, wet or shallow soils. Strategies for overcoming these shortfalls are included. The emphasis is always on gardening sustainably, even in difficult circumstances. Soil care for specific plant types such as woody plants, perennial gardens, roses, lawns, vegetables and annuals is covered with the preferred soil condition for each plant. The old ‘Right Plant in the Right Spot’ advice includes recommendations of specific plants to remedy problems in the garden. For instance, planting sweet woodruff can sweeten the acidic soil without the addition of lime. This is important to me, because any daffodils planted in one area of my garden do not thrive. Now that the sweet woodruff has spread, I am planning to plant more daffodils in October. I have had this book for three years and I recommend it to every gardener. I have read specific chapters more than once. In fact, the cover of this paperback is starting to come apart from so much handling. The New York Times called this book “A brilliant collection of garden handbooks,” and I agree. Its 100 pages of text contain some lovely photos, but most importantly there is an incredible amount of gardening expertise for sustainable gardening. The contributors: Sina Adl is an associate professor in the Department of Biology at Dalhousie University in Halifax, Canada. He is the author of The Ecology of Soil Decomposition. Craig Coggers is a research and extension soil scientist at Washington State University. He received his Ph.D. in soil science from Cornell University. He has written numerous journal articles and has taught soil classes for Master Gardeners for more than 20 years. Niall Dunne is a former editor of Brooklyn Botanic Garden’s Plants & Gardens News and Urban Habitats. He holds an M.S. in ecology and evolution from Rutgers University. Grace Gershuny is internationally known in the organic agriculture movement. She has written extensively on soil management and composting. She currently lives, gardens and composts in Barnet, Vermont. Caleb Leech is the curator of the Herb Garden and Hardy Fern Collection at Brooklyn Botanical Garden. Ulrich Lorimer is the curator of the Native Flora Garden at Brooklyn Botanical Garden.Janet Marinelli is the former director of Publications at Brooklyn Botanic Garden and is an award winning author of numerous articles and books on plants and gardening. Read her blog at janetmarinelli.com. Stephanie Murphy heads the Rutgers Soil Testing Lab in New Brunswick, New Jersey. She has a Ph.D. in soil biophysics, an M.S. in soil management and conservation, and a B.S. in agronomy. Anne O’Neill is curator of the Shakespeare Garden and Fragrance Garden and the former curator of the Cranford Rose Garden at Brooklyn Botanical Garden. Sarah Reichard is an associate professor at the University of Washington. Her research encompasses the intersection of conservation biology and horticulture, including invasive plants, and sustainable horticultural practices.Christopher Roddick is an ISA-certified arborist at Brooklyn Botanical Garden. He is a tree consultant and instructor specializing in mature tree preservation, pruning, and tree diagnostics.Ronald C. Smith is an extension horticulture specialist at North Dakota State University. He has an M.S. in horticultural soil analysis and a Ph.D. in landscape horticulture. Pat and Greg Williams have applied their MIT engineering training to good gardening experiments on their farm in central Kentucky. They are regular contributors to Plants and Gardens News and publish a monthly gardening newsletter, HortIdeas.